If we can't get our hands on the trendy Jet Black iPhone 7 version, we'll settle for the next closest option - matte black - or at least that seems to be the thinking of T-Mobile subs. The Un-carrier's flamboyant CEO John Legere took to Periscope earlier, to give us a glimpse of the preorder frenzy, and it turns out that the iPhone 7 buys have been no less than "four times bigger than the iPhone 6," and the most popular color has been the Black edition, or the one with the matte instead of the piano lacquer finish. Considering that the iPhone 6 was the largest upgrade in the iPhone's history, going from a puny 3.5" display to a decent 4.7-incher, this bodes well for the iPhone 7 sales in general, where 120 million folks that rock two-year or older iPhones represent a giant pent-up demand target. 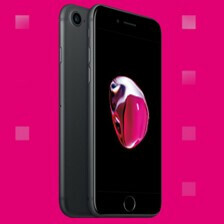 Of course, T-Mobile offers a free iPhone 7 if you trade in a qualifying handset in the form of bill credits, but all four carriers now do the same in one form or another, so even though Apple won't be announcing launch weekend sales as usual, the new iPhone duo seems poised for blockbuster holiday season. Although not my problem, im starting to get weary of how Note 7 will fare off. Good thing for apple. The matte black looks nice! It'll get fixed but the damage may be done now, many will find an alternative, tech geeks will happily take up the fixed model but I'd imagine a rushed Note 8 will be on the cards soon for the more general public (maybe even a change from the Note name now it's tainted in the press!). Hopefully if a new model is released quickly there's thorough testing of all functions - they'll get the battery right for sure but sometimes it's too easy to focus on the problem area and new ones come up! Samsung could maybe re-name it Note6. Anyways, this is a really good fortune for Apple, with such huge pre-orders. If i bought the note 7, i doubt i will want to own in the future. It seems like they rushed the note 7. Safety checks where unable to pin point this issue? Ill be damned. The same Quality Control issues happens to other companies. Apple's safety checks could not pin point the antennagate and bendgate, but that didn't kill the iPhone's hype, nor did it make Apple lose it's fanbase. Why do you doubt about owning a Note7 (after the replacement units)? For some reason it just scares me. I dont even own one, but ill avoid owning one till the next generation. when did airports ban Apple devices? How much Samsung is payng you for each comment? Or this is voluntary service from you? Did you take a leave of absent from your office just to do this? Or are you jobless? If not how do you find this much time to post comment after comment. These are the question I want to know. Before august 20 your comment was less than 150 but now you have more than 900 comments. Very curious. Because when you spend upward to $900 dollars you would think they would have something as dangerous as fire hazards ironed out on a phone. And as far as the exchanges go, word is they won't make it to the US anytime soon since the Safety regulations are stepping in now. It took those damn hover boards 6 months to get reapproved. And besides, Apple has the superior product right now. The galaxies are nice and I've purchased many of them, but they all lag and feel cumbersome after the initial purchase period. So I'm switching back. Sue me. I agree to the most part but then bend gate and antenna thing never put any lives in Danger. Unfortunately there is too much media attention to salvage the true "BOSS" phone. NOTE 7. Note 7 FTW ! at least till S8 Edge comes along. Honestly, i feel like they should leave that note name. Check out any samsung article, you will definitely find trolls making fun of the battery debacle. Im pretty sure they rushed the note 7. No competition from their closest rival. If I am Apple I would mark up another $200 buck. Like what Nvidia did with their GTX 1080 supply shortage. It's not just about competition from Samsung. It's simply because there is no other alternative in the iOS ecosystem. So, if people want ian iOS device, their only option is Apple. I can bet you that if iOS was open source, then Apple wouldn't be making even half of the profits they make now, because too many OEMs would be offering better iOS devices than what Apple currently offers. Not to mention those chinese OEMs with flagship killers. This is mainly the progress T-Mobile has made rather than Apple selling 150 million iPhones this quarter. Back when the iPhone 6 came out T-Mobile was just getting started with their blockbuster growth. Have to wait for cumulative numbers at the end of the quarter to see what the real popularity is. Also, Apple only has 70 million iPhones being made by their numbers as well so it probably won't be higher than that. Okay, @Finalflash But doesn't Apple benefit from it T-Mobile's progress? So, you mean: If Apple sells 150mil iPhones in this quater, it's mainly due to T-Mobile's progress... Or, did I get you wrong? FinalFlash, you are one of the biggest Apple hating trolls/idiots on this site. You ramble a lot and hardly make any sense, i don't even know where to begin. why cant we all disagree in a civil fashion? I hardly comment here, but it pains me a lot to see how poorly this site takes moderation. PA, no serious individual will take your site seriously until you guys clamp down on a lot of these trolls. I agree with you! The exclusiveness of iOS really helps Apples bottom line. Props to Samsung as well for taking a commoditized OS and making loads of money of it. If only the others could even come a lil close? as a company, they must think about long term not short term profit. raise their price just because of supply shortage or because competitor product is in trouble is not feasible for long run. Well. When you have 4x the customers. This can only be expected. IT IS NOT TRUE AT ALL !!!! HOW CAN YOU SAY THAT? THE PREORDER FOR THE IPHONE 7 FOUR TIME BIGGER THEN THE PREORDER FOR THE IPHONE 6 ???????????? I AM SURE APPLE INC IS PAYING YOU A GOOD QUANTITY OF MONEY FOR SAYING THAT. I just want to know, did T-Mobile get the iPhone with the Intel modem or the Qualcomm modem, and does it support MIMO, EVS and the other network technologies T-Mobile introduced on their network this year? Jeez, it went from 4" to 4.7" . Why does P.A even pay these guys? This proves that when it comes to the iPhone user base, removing key elements of the phone is a new feature in itself that's considered exciting and worthy of an upgrade. Don't come crying to Apple when they remove your screen or speakers claiming it's an improvement.